By Rocky KirstnerIn the Dakotas, members of the proud Lakota Nation rose in protest this week to join a 48-hour hunger strike in opposition to the Keystone XL pipeline—and all tar sands pipelines—they say will destroy precious water resources and ancestral lands in the U.S. and in Canada. 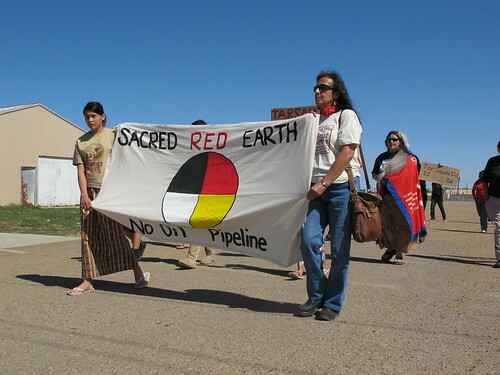 On Sunday, dozens of hunger strikers and supporters marched at a rally against tar sands oil mining operations and pipelines in Eagle Butte, SD, a impoverished community on the Cheyenne River Indian Reservation, close to TransCanada’s 1,700 mile proposed Keystone XL pipeline route to refineries in the Gulf. Natives Have Environmental and Spiritual Concerns Over “Prioritized” Keystone XLAmerican Indians have generally sided with liberals on the issue, maintaining that the continued use of fossil fuels is an attack on nature, and also voicing concern over the potential for catastrophes such as the one in Michigan that leaked over 800,000 gallons of oil into a creek that feeds the Kalamazoo River. Additionally, some tribes are now worried about sacred sites in the path of the seemingly imminent pipeline. According to an Associated Press report, Chief George Thurman of the Sac and Fox Tribe has expressed concern that the pipeline will disturb unmarked graves. A spokesperson for Transcanada, the company building the pipeline, said that its route had been selected to avoid as many registered sacred sites as possible, and that there are procedures in place to deal with unexpected archaeological finds. But for many Natives, it’s not just about what’s in the ground—it’s also about the ground itself. As Sandra Massey, the Sac and Fox Nation’s historic preservation officer, said, according to the AP, “Even if nothing is left, it’s still a sacred site.”Comment: I'm not sure it counts as a hunger strike if it has a time limit. But if it accomplishes something, never mind. For more on the Keystone XL pipeline, see Protesters Block Trucks on Pine Ridge and Chief Predicts "Aboriginal Uprising."